This garlic cauliflower mashed potatoes recipe is simply magical. It's like mashed potatoes met cheese fondue! The addition of goat cheese adds a tanginess, which cuts through the richness, and balances this sauce perfectly. Pairs perfectly with lamb chops and chicken. 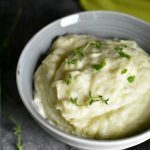 Steam cauliflower, potatoes and garlic: If using the Instant Pot, turn it on. Pour 1 cup water in the main pot. Place rinsed and drained cauliflower florets, peeled and quartered potatoes and peeled garlic cloves in a Steamer basket or an oven safe bowl. Close lid. Vent set to sealing. Pressure cook on 'Manual' or 'Pressure Cook' for 8 minutes, high pressure. If using the microwave, Add everything in a microwave safe bowl, add 1/4 cup water and steam on Potato setting. Transfer to a bowl: Turn off Instant Pot, manually release pressure by gently turning the pressure knob from 'Sealing' to 'Venting' position (QR). Open lid after the pin drops. Remove the basket and transfer cauliflower, potatoes and garlic to a large mixing bowl. Put it together: In a microwave safe cup, heat heavy cream for 1 minute or so. Add butter, goat cheese, salt and pepper and whisk it well, till you see no lumps. Pour over the cauliflower, potatoes and garlic. Using a fork or a wooden spoon, mash till you get a creamy consistency. Add grated parmesan cheese and mix till incorporated.